Me and fruit have a rocky past. Most tropical fruits except for pineapple, no thank you. All stripes and dimples of melons is another no-go. Bananas and me have never been friends (well, except when it comes to banana bread & then I’m ALL IN). Most berries and sour apples are the exceptions. I know, I’m fairly picky and I hope one day to grow out of this fruitphobia. Trust me, over the years, I’ve made amazing strides. Hating on bananas makes smoothie-making a bit tricky. Usually I just blend up frozen cranberries and strawberries with cranberry juice and yogurt and I’ve been happy with the results. Tart, refreshing and vibrant in colour. But now I’ve got a new trick up my sleeve. Enter frozen peaches. I just saw a bag of organic frozen peaches in the frozen section of my local organic grocer and bought a bag to try out. I’m now on bag #2 because frozen peaches make an excellent smoothie filler. They also go wonderfully with sour cherries without diluting that wonderful sour cherry flavour. And because I love sour cherries, I’ve managed to stow away a few buckets full from last summer in my freezer. It’s a treasure trove of sour cherry goodness in there! 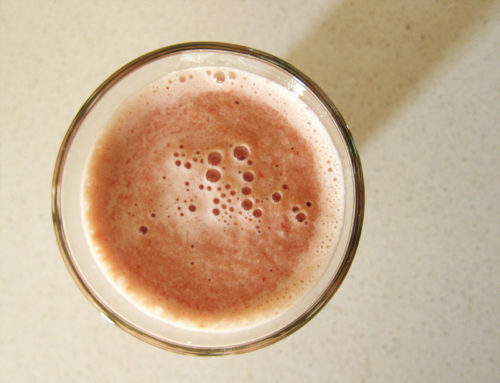 Enter my new favorite snack: a sour cherry smoothie! Sure smoothies are wonderful for breakfast, but as a mid-day pick me up, I think this smoothie makes a fantastic treat. Because we’re dealing with sour cherries, unsweetened sour cherry juice and unsweetened yogurt, this drink needs sweetener. Normally, I’m loathe to add any added sugar, but for this recipe, you’ll definitely need at least some of it. I used agave syrup since that’s what I had on-hand, but honey would be a fine substitute. I picked up a few bottles of sour cherry juice last time I was stateside at Trader Joe’s or check your local health food store. You could use a sweetened juice and a sweetened yogurt and skip the agave syrup, but I trust my own measurements, ingredients and tastebuds over something pre-made. You could halve the amounts and use a stick blender for a personal smoothie, but I use my found-at-Value-Village-for-$4-ten-years-ago classic beehive vintage blender and it does a fantastic job for 2 large glasses full. In an unrelated note, I’ll be participating in an Etsy/West Elm pop up shop curated by Jan of Poppytalk this coming Saturday. You can find all the details over on the facebook page. I’ll be selling my cards, prints, birthday calendar & wrapping paper and I’d love for you to stop by and say hi. It should be a fun & interesting way to shop! You might need to add in some water or extra juice if you like a thinner smoothie or some more fruit for a thicker version. Play around until you get your own version! 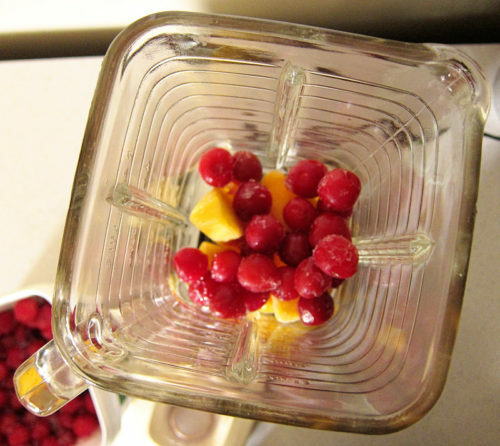 Add the frozen peaches and sour cherries to your blender. Top with the yogurt, sour cherry juice and 1/2 of the agave syrup. Blend on high until smooth. Taste & add more agave syrup if needed. Pour into 2 large glasses. 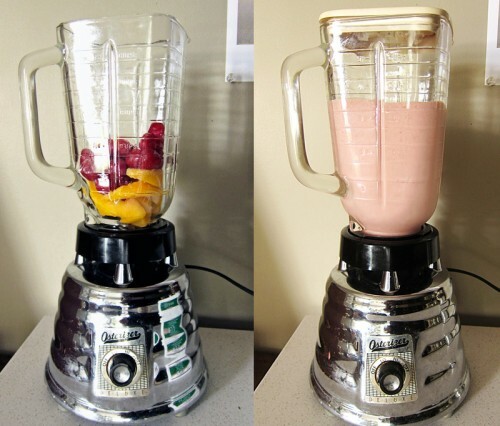 Man – what a sweet blender! 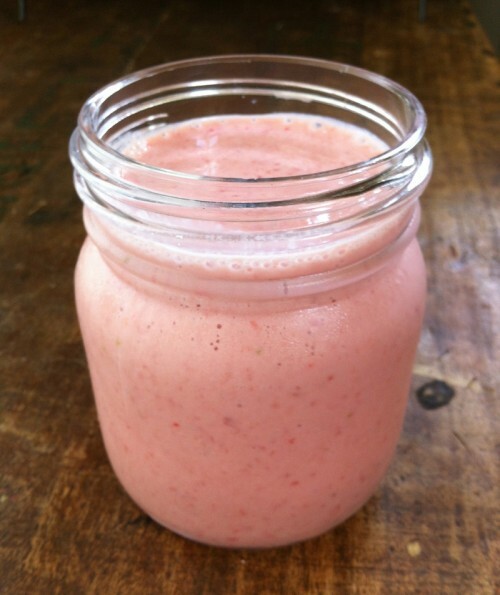 And this peach and cherry smoothie sound awesome, i love that combo. In a pie, in a smoothie, its all good. Frozen peaches in place of a banana sounds like a brilliant idea. I’m a lover of bananas but I have a friend who loathes them so this will please her no end. Gorgeous blender too! We never seem to get a lot of sour cherries around here, unfortunately! I’ll have to check out the sour cherry juice from TJ’s though. That sounds delicious. I was just at Trader Joe’s too, darn! Caz, thanks! I’m glad I’m not the only banana-hater around! Hope your friend loves the substitution! I recently rediscovered smoothies. They are so good! I love all diiferent kinds of fruit, but I totally get that some aren’t always appealing. This sounds great with peaches and sour cherries! I love smoothies as an afternoon pick-me-up too! I started freezing my own peaches two years ago, and they’ve become one of my favorites for smoothies. I adore smoothies, but my little Magic Bullet has been having a difficult time lately. I am totally going to check out Value Village to see if I can find a used blender. A new blender just isn’t in the budget for me right now, but that is a fantastic idea. Love the bright tartness of this smoothie too! Laura, I agree! Smoothies make a wonderful snack and it’s fun to try out new fruit combinations. Gretchen, I love that you freeze your own peaches! I’m definitely going to try that this summer since buying small bags of organic frozen ones are getting expensive! Thanks for the tip! Yes, Amanda, do try to find a replacement. No need to buy new. My first blender was from a garage sale and then I found this one – the older one still worked, but I loved the look of the beehive style better, so I passed it onto a friend. Check Craigslist too or garage sales – blenders should be an easy find 🙂 Good luck! Yeah, cherry season is around the corner so I will be trying this smoothie recipe out! Funny though, I have never seen frozen peaches in the supermarket, just mango. But I am totally fine with using mango in a smoothie in lieu of peaches…as peach season is still a while away. Love your beehive blender btw! It sounds like we have the same relationship with fruit. Looks like I have no choice now but to try this smoothie. Thanks for the great share. Enjoy Patty! Glad to see I’m not alone with my fruit phobias.